Perfectly cooked rice on a stove needs a great attention and time to time check. Uncooked rice gets hard and grainy and on the other hand, overcooked rice becomes mushy and leave a difficult clean-up job afterward. Why Buy A Rice Cooker ? A rice cooker helps you to get rid of the above-mentioned problems and provide you well-cooked rice with ease. The most basic rice cooker model makes cooking rice easy as flipping a switch. Modern and more sophisticated rice cookers allow you to adjust for different kinds of rice, using these you can prepare basic basmati rice to sticky rice for sushi. 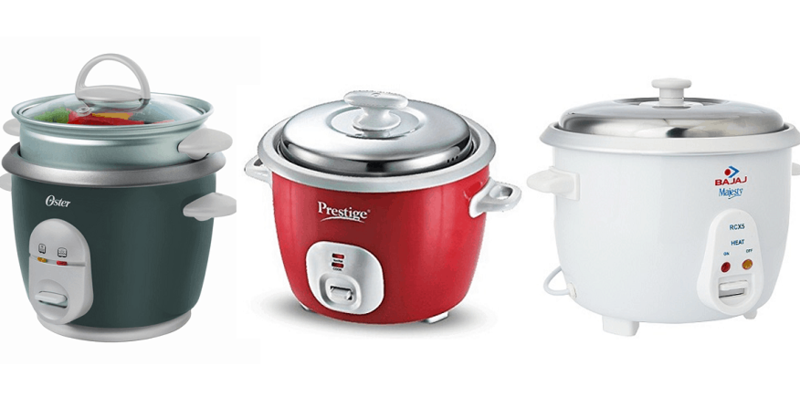 Rice cookers are not for cooking rice, there are many models of rice cookers available which are perfect for cooking oatmeal, steaming vegetables and even baking. Rice is a staple food for almost everyone around the world thus we have gathered top 10 rice cookers which will make cooking rice easy for you and are equally of great quality. To know more about them please keep on reading. Keep warm feature: keeps rice warm for some time. Cool touch handle: The handle of the cooker must be cool, which enables safe handling of the product. Steam tray: It is an additional tray that enables steaming of vegetables in the cooker. Size: The size of the rice cooker also effects the rice cooker that you choose. Cooking time: A rice cooker having a fast cooking time is always preferred by all. 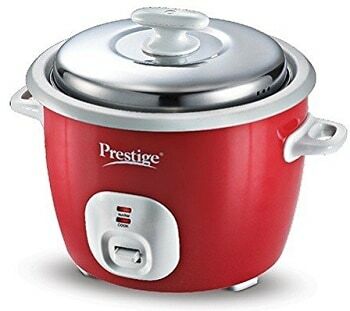 1) This very cute electric rice cooker manufactured by prestige is having the capacity of 1.8 to 2 litres. 2) The colour of this cooker is very attractive and is perfect for not only rice but it is having the ability to cook your entire menu. 3) Using this rice cooker you can prepare soup, porridge, stew, pulao, idlis and steam vegetables with ease and convenience. 4) it cooks rice very fast thus saves your time a lot. This rice cooker comes with an additional cooking pan. Using this product you can cook rice within just 15 minutes and the colour of this product is very attractive. After using this product for few months the heating power may drop. 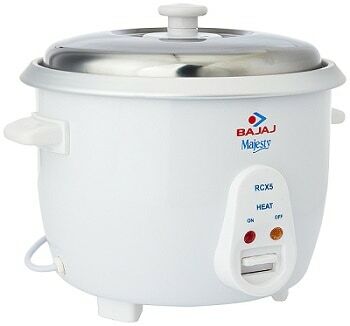 1) This rice cooker manufactured by Bajaj is having a capacity of 1.8 litres. 2) It allows you to prepare rice quickly without any hassle and it also saves your kitchen space. It comes with a stainless steel lid bearing steam vents. 3) This product comes with a 2 years warranty and the cooking bowl is aluminium with anodized finish. 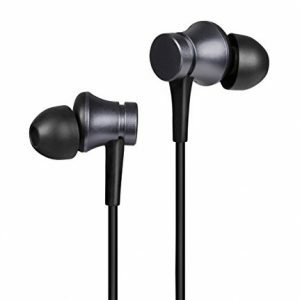 4) According to the essential features, it is very compact in size thus one can carry it around while traveling. This rice cooker comes with a detachable power cord which enables you to place this cooker after use wherever you wish. 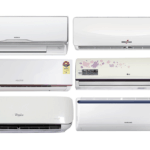 It requires less power, thus does not affect the household electric bills. The heating speed of this product is slow and automatic switch off is not available. If the rice gets overcooked by any chance, the bottom rice gets burned. Since this rice cooker is not automatic, it needs manual intervention when it turns from cooking to keep the warm mode. 1) This white coloured electric rice cooker by prestige is having a capacity of 1 litre comes with two aluminium cooking pan and cool touch handles. 2) This rice cooker comes with an easy to operate control switch which makes operating this rice cooker easy. 3) It comes with a detachable power cord which enables the user to carry the rice cooker anywhere which in turns makes the serving of rice easy. 4) According to the essential features, it is having cool touch handle thus makes it different from other cookers that are not having this feature. This cooker cooks fast and the bottom plate needs no water. Handling this cooker is very easy and it cooks rice for 2 to 3 persons. This is a very reasonable product and is value for money. As the capacity of this rice cooker is only 1 litre, it is only well suited for families having 2 to 3 members. Cooking rice for more than 3 people at a time is not possible using this cooker. 1) This prestige 700-watt electric rice cooker reduces the cooking time by half as it comes with a lot of advanced features. 2) This rice cooker can be connected to any external power source with ease and it comes with a detachable power cord. 3) This rice cooker uses 700-watt power is capable of cooking 1kg of rice at a time. This cooker also has two different cooking modes i.e. speed cooking and keep warm. 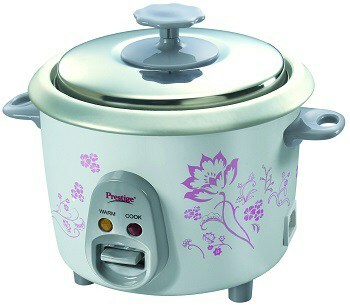 4) According to the essential features, this rice cooker is able to cook fast and it also keeps the rice warm. 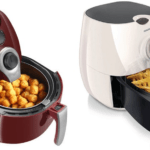 This cooker is having two essential features thus purchasing this is beneficial. This rice cooker uses steam which makes the food cooked in it healthy. 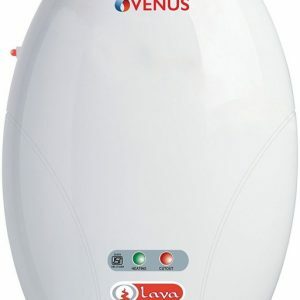 This product is very economical and is one amongst the best rice cookers available as it comes with keep warm function. If the keep warm function is used for more than 10 minutes then cleaning the cooker becomes a problem as the rice gets stuck in it. 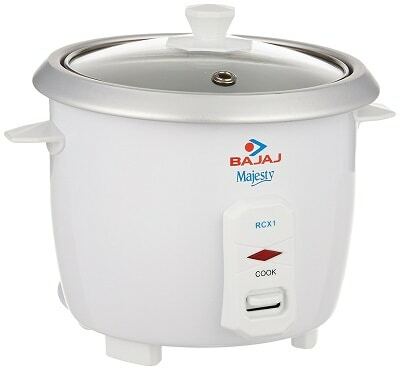 1) This mini multifunction rice cooker is manufactured by Bajaj and has a capacity of 0.4 litres. White in colour this rice cooker needs only 200Watt power to run. 2) This cooker comes with a transparent lid which makes sure that the rice is perfectly cooked. 3) As this rice cooker is small in size, it is very easy to travel with it. This rice cooker is able to cook 0.2 kg of rice at once. 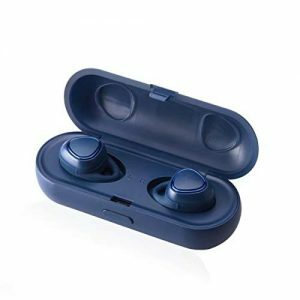 4) According to the essential features, the size of this product is very compact making it travel friendly. This rice cooker is travel-friendly because of its small size. Comes with a transparent lid to monitor the rice. Also, this rice cooker is very easy to operate. This product is only well suited for cooking rice for maximum 2 people at a time as the bowl is small in size. This product doesn’t come with any warranty card. 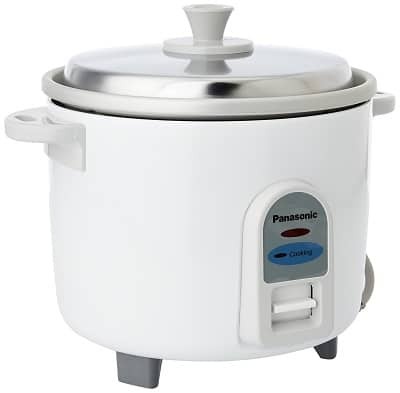 1) This is an automatic rice cooker by Panasonic so you don’t need to worry about your rice not being perfectly cooked. 2) This cooker is perfect for cooking rice for almost six people and is very lightweight. 3) It comes with a lightweight anodized aluminium cooking container which is chip-resistant and durable. It also comes with an additional scoop holder which ensures that the scoop is readily available for serving and stirring the rice. 4) This rice cooker is automatic thus switches off automatically after the rice is cooked, it is one of the essential features that one must look for while purchasing a rice cooker. This product is highly durable and cooks rice perfectly without any inconvenience. This rice cooker cooks 1kg of rice within just 20 minutes, which is very quick. This cooker comes with no warm cooking option and it also comes with no extra bowl. 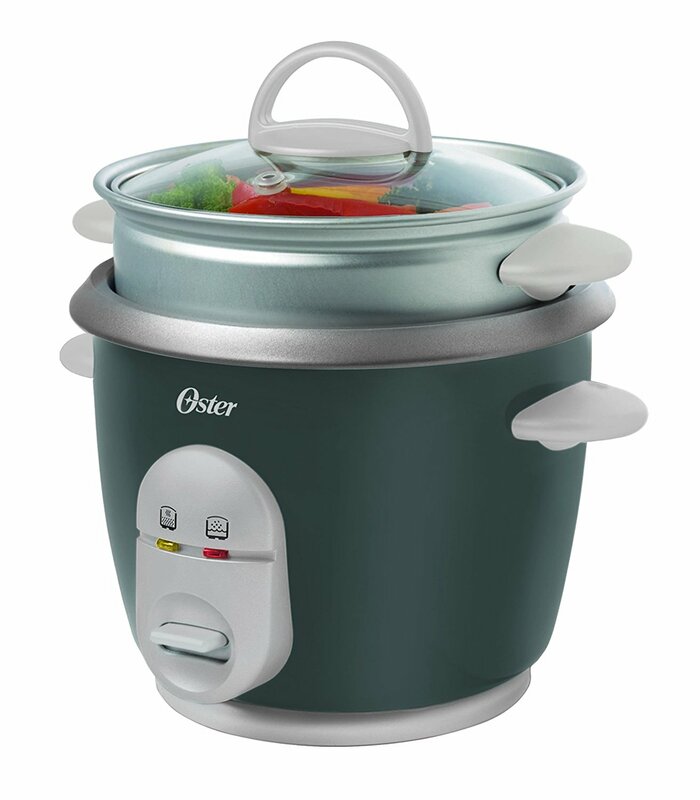 1) This rice cooker by Oster comes with a steam tray and has a capacity of 1 litre. This is a one-touch manual cooker which is designed with automatic keep warm and auto shut-off setting. 2) It comes with a glass lid and steaming tray for vegetables. Additionally, it also comes with a power on indicator light. 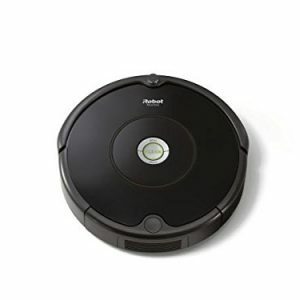 It has a removable non-stick pot which enables easy clean-up. 3) Having a steam tray is a essential feature as it enables you to steam vegetables with ease. 4) It also has automatic keep warm and auto shut-off setting. Thus it is having three essential features of a rice cooker. This rice cooker is perfect for cooking rice for 2 people. It comes with a keep warm option and automatic switch off. This rice cooker is only suitable for a small family or cooking rice for only people, the capacity of this product is not very high. 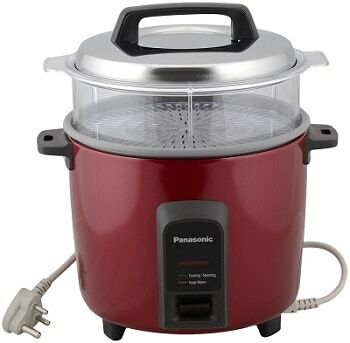 1) This electric rice cooker with unique burgundy and silver colour by Panasonic comes with a non-stick cooking pan and needs 750-watt to run. 2) This cooker comes with an auto function which allows you to perform other household chores while the rice gets cooked. 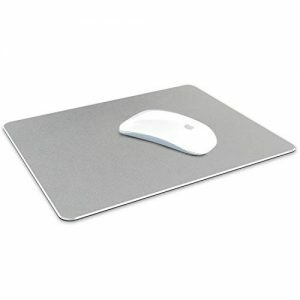 3) It has a convenient bridge handle which makes it easy to use. It also has 4 hours keep warm function. Having an auto function is very essential and it also comes with a non-stick pan. 4) These two features makes it different from other rice cookers available. This product comes with a 2 years warranty on product and 5 years warranty on the heater. This rice cooker is very easy to use and cooks rice perfectly. As it is having a non-stick base, the rice or anything that you cook will not stick to it. When the rice is not cooked perfectly, the automatic turn off option doesn’t work properly. The LED light in this product is not very luminous and is very difficult to notice at once. 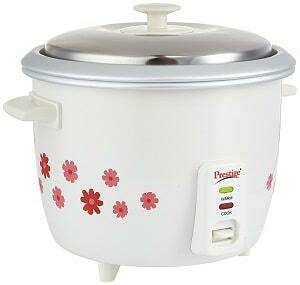 1) This rice electric rice cooker is manufactured by Prestige and is white in colour. It comes with a stainless steel close fit lid and two aluminium cooking pan. 2) It has a detachable power cord which is very convenient and the cool touch handles make it easy to carry around. This product has speed cooking and keep warm function. 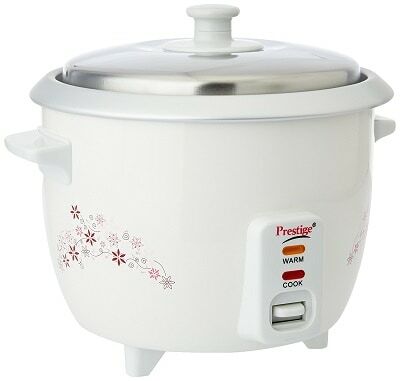 3) This rice cooker is not only perfect for cooking rice but also other food items such as idli, porridge, stew etc. 4) This rice cooker comes with two essential features .i.e. keep warm and speed cooking feature. This electric rice cooker is good for couples only and it works perfectly fine. The rice gets cooked perfectly in it. The detachable power cord makes it very easy to keep it anywhere after cooking. This rice cooker even after having speed cooking function, it takes around 30 to 40 minutes to cook rice perfectly. 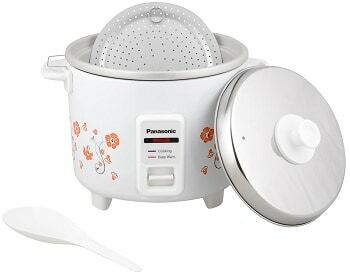 1) This automatic cooker warmer by Panasonic is having a capacity of 2.7 litres and needs 450-Watt power for running. 2) This comes with an auto switch off option so you don’t need to worry about the rice getting overcooked and there is also no need to check the rice again and again. 3) It comes with a 5 hour keep warm function and has an aluminium anodized pan. It also comes with a warranty period. 4) This rice cooker is having a 5 hours keep warm feature and automatic cooking feature which are very essential features to look for while purchasing a rice cooker. This rice cooker works perfectly and cooks nice. It is perfect for bachelors as one can cook other food items in it as well. The keep warm facility in this product also works very well. This product doesn’t come with any measuring cup which is a negative point. It is only well suited for small families. The cooking bowl is small in size and the switch sometimes malfunctions.